Utterly show stopping, this opulent bridal set is the ideal symbol of your love and devotion. Features an engagement ring showcasing a dazzling emerald cut sapphire surrounded by one carat of diamonds in a halo setting with diamond set shoulders, and a beautifully complementary diamond set half eternity style wedding band. 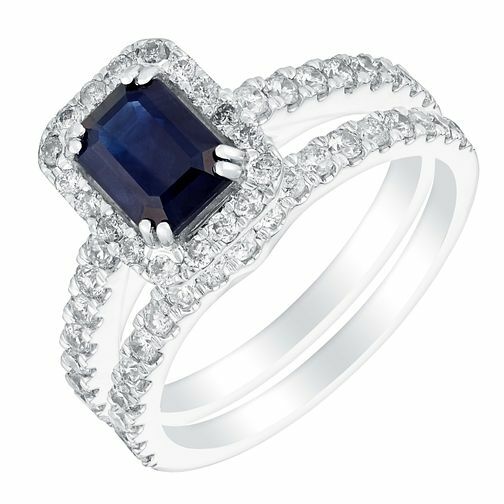 18ct White Gold 1ct Diamond & Sapphire Bridal Set is rated 4.9 out of 5 by 9. Rated 5 out of 5 by Anonymous from Royal Engagment My partner knew me so well when he picked this bridal set out. He knew how much I loved Princess Diana's ring growing up and even more now Kate Middleton wears her ring. I can only describe this ring as Royal... Everywhere I go I get comments on how stunning the ring is. A ring fit for any princess.... simple magical.